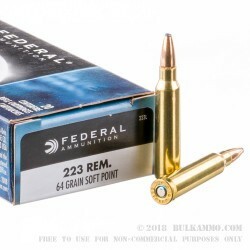 These affordable rounds from Federal's Power-Shok brand are perfect for the prospective deer hunter who owns an AR-15, Ruger Mini-14, or any other model of rifle chambered in the ever-popular .223 Remington! 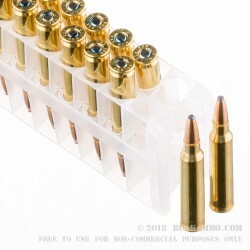 This cartridge profile is built using high grade components including a clean-igniting Boxer primer that is fitted to a reloadable brass casing with a compliment of pocket sealant; this moisture-resistant substance defeats ambient humidity to keep the round functional in storage conditions or after miles of field trekking. 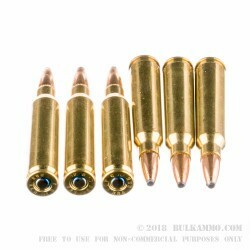 Each case is crimped to a 64 grain projectile at its toothed cannelure in order to prevent accuracy-robbing setback from occurring with repeat chambering and ejection. The soft-point projectile possesses a minimally exposed lead tip with a covered base that prevents excess fouling from populating your favorite hunting piece. Upon impact with a game animal, the bullet experiences a controlled rate of expansion that is slowed by the strong copper jacket and grooved cannelure. This calculated increase in diameter allows the bullet to defeat thick hide and bone before reaching peak size and transferring tissue-shattering energy into more vital zones. All the while, the mushroomed round yaws in direction which creates a large, free-bleeding wound in a target in order to achieve a quick, humane drop. Federal Power-Shok ammunition is backed by over 95 years of manufacturing experience and designed to supply sporting shootings with low-cost hunting options that deliver excellent performance.